Apologies for the tardiness in recent postings; it’s been an exciting and busy time both….. I know this is another smoked salmon post, but it’s based on a dish we both thoroughly enjoyed a while back albeit with some roast beef. 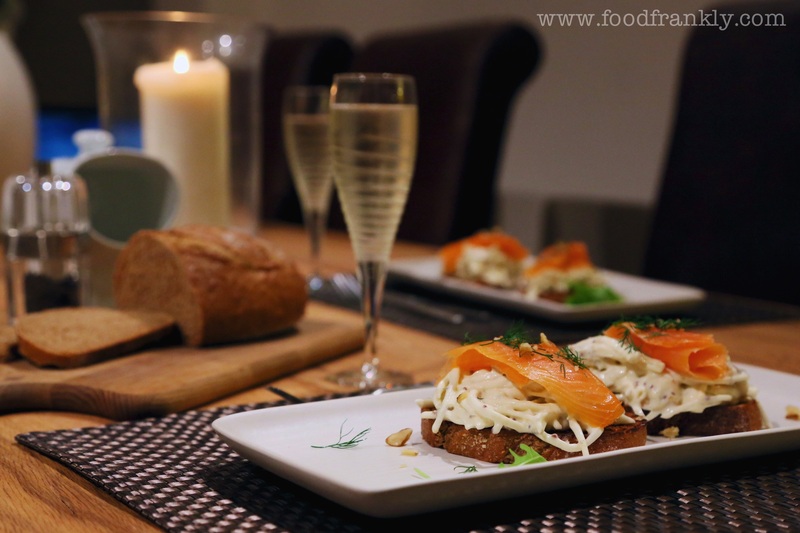 It’s a classic celeriac remoulade with some griddled rye bread and good smoked salmon. I’ve tweaked the remoulade a little but it works nicely. Criminally under used, in the UK at least, celeriac is brilliantly versatile and this is a superb way of using it – just make sure you don’t drown the delicate flavour in a tidal wave of mayo. I actually added a bit of creme fraiche, courtesy of a tip from Nigel Slater that I liked. I think it worked. As before, this borrows heavily from recent Scandinavian influences so even though the calorie count is moderately high, it darn well does feel like it. Besides, the festive season is round the corner and this feels just about right I think. Plus, it’s cold outside. The glass of Prosecco, whilst doing nothing for my sense of masculinity was nevertheless a great pairing too. 4 slices of good smoked salmon. Juice the lemon and place half of it in a bowl large enough to eventually hold the celeriac. Keep the rest for later if you feel it needs it. Peel the celeriac well (remove all traces of the knobbly skin) and julienne into strips – don’t be too exact about it. As you make the julienne celeriac, mix it into the lemon juice to stop it browning. 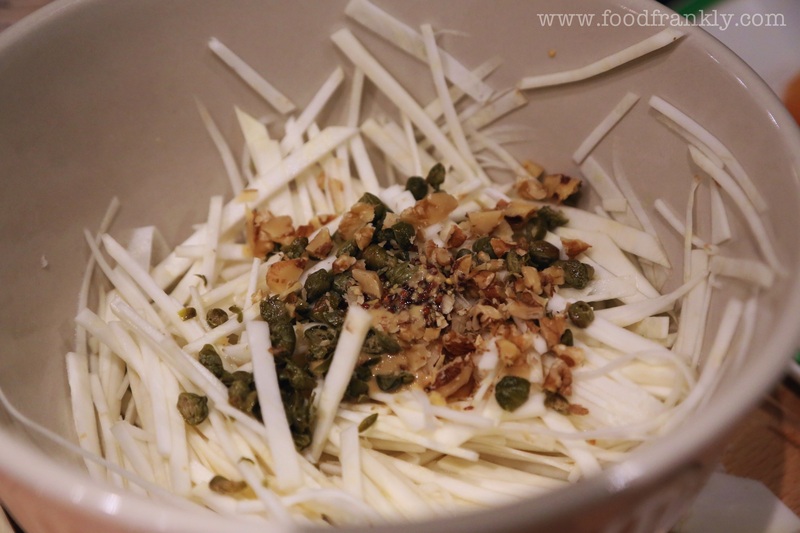 When done, chop the capers and walnuts. Throw them into the bowl with the two mustards, mayo and creme fraiche. Mix thoroughly, season with a little salt and taste. Tweak the mixture to taste – add some more mustard if you like, or a little more lemon. Leave to rest for 20 minutes or so. Lay out the salmon to bring to room temperature. Heat a griddle on a high heat until smoking hot. Slice the rye bread and brush well on each side with olive oil. Season with sea salt and griddle until nicely charred on each side. 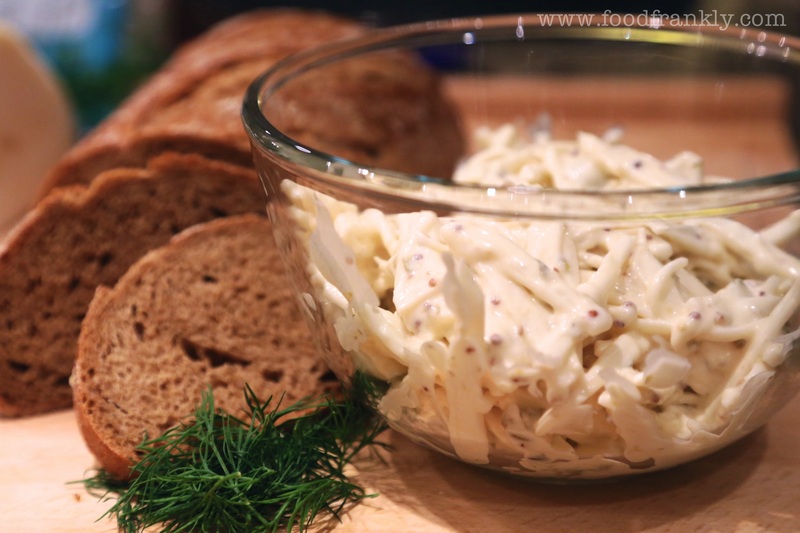 Layer the celeriac remoulade on the rye bread, followed by the salmon and sprinkling of the chopped dill.